We rescue Shelties from puppy mills and shelters. We also collect Shelties that have been turned in by their owners surrenders or found as strays. Our desire is to give these animals a second chance at life. We place them in foster homes who nurture, love, temperment test, housetrain, obedience train and work with behavior problems when needed. These dogs become part of our family. 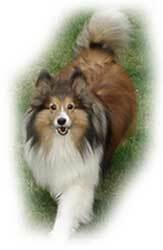 We then find the perfect home for each Sheltie by matching the needs of the dog with a person or a familty. In order to make this perfect match, we have to ask a lot of questions, including a thorough screening process to determine the appropriate home. A pet is a life time commitment, just like children and should never be entered into without a great deal of research and thought. We are an all-volunteer, private organization dedicated to helping homeless Shetland Sheepdogs in North Carolina and nearby states. We give our time and love just because we love these Shelties. Our volunteers are not paid for their time and efforts and all our funds are from adoption fees and donations. Sheltie rescue is a lot of work and we can't do it alone. We need volunteers to help foster and pick up shelties. We need volunteers with fenced yards, an extra crate and someone who can occasionally take a rescue for veterinary care. If you are interested in becoming a volunteer, please get in touch with us by phone or email. We will be happy to discuss any concerns you might have about becoming involved with sheltie rescue.